This walk: 2015-4-29. 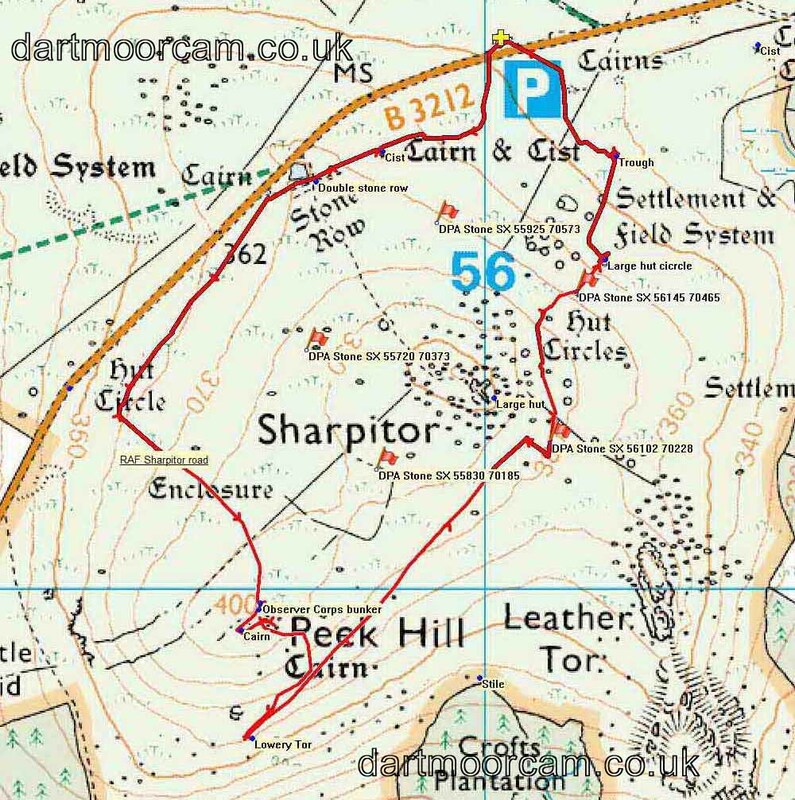 Sharpitor, Leather Tor, cist, stone row, Goatstone Pond, RAF Sharpitor, Peek Hill, cairn, Burrator Reservoir, Lowery Tor, reaves, DPA boundary stones. Blocking stone at the eastern end of the stone row, at SX 55762 70648 (approx) ..... it is possible that the row extands past this point ..... or were we seeing part of the single stone row? Jeremy Butler (1994), Dartmoor Atlas of Antiquities, Vol. 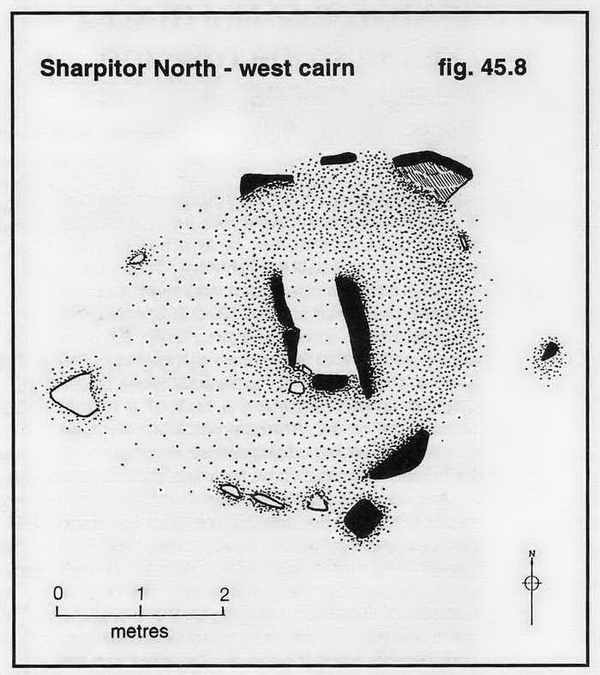 4, 45.12: Sharpitor North-west single and double stone rows and nearby cairns, pages 44-46. Regarding the stone row, there is a blocking stone at the east end, near the cist. The row is 113 metres long from the blocking stone to the centre of the terminal cairn at the western end. The distance between the stone rows and the cist is about 75 metres. Two stones of the row, taken from a low angle: Megalithic Portal link. Goatstone Pool, beside the B3212. From this area, we walked up the no-longer-existent road that led to RAF Sharpitor. The road was originally lined on the right side by white-painted stones. I remember the finger signpost that pointed to "RAF Sharpitor" up there, from when I was a youngster, in the back of Dad's car, often wondering what planes, such as Hurricanes and Spitfires and Gannets and Skyraiders they might have up there! Such was young innocence - we lived near RNAS Culdrose, mand we saw the naval versions of these planes on an almost daily basis - naval versions were adapted for flying from aircraft carriers. English Heritage Register of Monuments at Risk Register - this mentions Prehistoric coaxial field system and cairns, an historic enclosure and part of RAF Sharpitor, situated on and around Peek Hill"
The Royal Observer Corps Remembered web site has a photograph and links to Location: SX55657003 Opened 1963 Closed 1991 Date of visit: Aug 2009 Post is demolished. The remains of the access shaft is still visible but backfilled. Nearby rubble is probably from the post. Widecombe History Group Minutes from October 2007 record: Doug & Lyn Pidgeon brought some details of the RAF Sharpitor Mast for Mike Wright who raised the subject at his talk in September. A good article on the subject can be found in The Dartmoor Magazine number 83, Summer 2006 written by Bill Wilkinson. 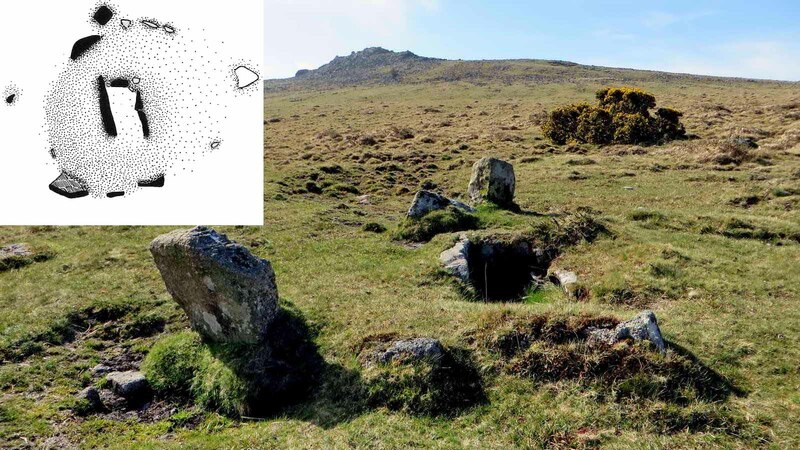 The following information is culled from The Field Archaeology of Dartmoor, Phil Newman, (2011), English Heritage, pp.241-242 ..... the site, established from 1942 onwards, is poorly represented even on OS maps from the 1950s because of its secret nature. The Royal Observer Corps (ROC) could spot aircraft with basic optical equipment. In the 1950s, an underground bunker was constructed nearby to "listen" for nuclear blasts from the testing of nuclear weapons by the Soviet Union. This particular example remained in use until 1991 - a "typo" for 1971? (Source: Subterranea Britannica). The blocked access shaft and two blocked air vents are still visible. The standard three-man ROC bunker had two rooms where the larger, monitoring room was over 4 x 2 metres in dimension. Just north of the ROC post are a few remains of RAF Sharpitor-proper: this was a transmitting station set up early in WW2 to guide British bombers into Europe, being part of the Gee Chain (see here). The main feature was a 64 m (210 ft) wooden mast that was replaced by a metal version in a 1956 upgrade. There were at one point 36 personnel stationed here in Nissen huts etc. The site was largely cleared in 1970. RAF Sharpitor, a transmitting station established early in World War 2 circa 1942 and abandoned in 1971. This small 'Technical site' served as the master transmitting station for the South Western Gee chain and was one link in the national Gee chain - a radio navigational system that enabled aircraft navigators to fix their position accurately throughout most of Europe. The station had a 210ft wooden transmitting tower and seven nissen huts including a transmitter block. A 'Domestic site' nearby (SX 57 SE 230 ) served as the personnel accommodation area until it was demolished in 1949. The station was upgraded with the addition of a new transmitter block and a 240ft high steel transmitting tower in the mid 1950s. In its heyday 35 service personnel were stationed here including 12 technicians who worked a shift system. The station, located just off the prominent summit area of Peek Hill, was demolished and cleared by 1972. The outline of many of the early buildings traceable as slight brick and concrete foundations up to 0.1m high were surveyed in 2007"
Google Map link to the RAF Sharpitor site. Zoomed view to St. Mary's Church, Walkhampton. Either an Iron Age cist, evidenced by the reinforcing steel rods, or, the entrance to the bunker: there were steps down to a room with a table and a bed until it was vandalised - then it was sealed shut. Zoomed view of the Longstone Manor area this photograph was posted on Twitter after the "recce" and with several people retweeting it, it reached 7,311 people. Last week's Sugar Lump Stack at Great Mis Tor reached 18,820 people! Looking at Leather Tor from Peek Hill. Nice to see someone on the road to recovery. Something quite ancient ............... the hawthorn tree, that is. Bronze Age reave between Sharpitor running to Leather Tor known as Leather Tor Reave, apparently dividing open pasture: illustrated by Andrew Fleming ( 1988), The Dartmoor Reaves: Investigating Prehistoric Land Divisions, BT Batsford Ltd, London, page 50 (fig. 27). Zoomed view to Hart Tor, SX 581 720, elevation 390 metres (1279 feet). The Walkhampton Common Reave running towards North Hessary Tor, forming a boundary between the watersheds of the River Walkhampton and the River Meavy. The settlement here is described by Jeremy Butler (1994), Dartmoor Atlas of Antiquities, Vol. 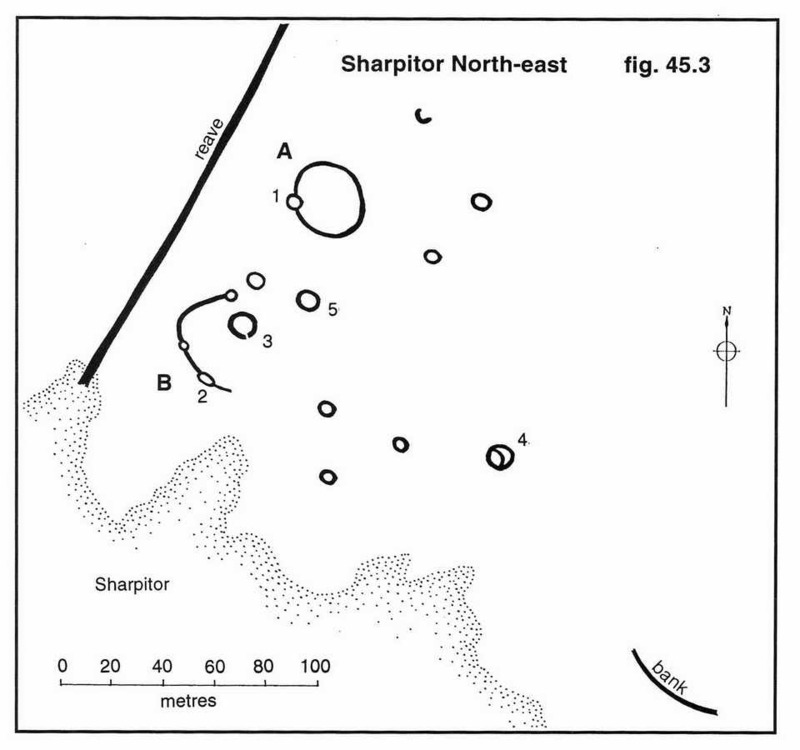 4, 45.3,4: Sharpitor North-east and South-east hut groups, pages 39-40. The hut in the photographs above and below, with a large, curved dividing wall, is labelled as "4" in the diagram above and 7.7 metres in diameter, being one of only two large huts in the settlement. Final photograph on the day at Hut 4, in sight of the car park. © Crown copyright and database rights 2015. Ordnance Survey Licence number 100047373 Use of this data is subject to terms and conditions. Also, Copyright © 2005, Memory-Map Europe, with permission. The five marker flags denote the locations of DPA boundary stones that were located during a walk on 24 May 2008 I keep them here so as not to lose them! This walk was reached by driving from Yelverton towards Princetown and parking on the left after descending Peek Hill at the P symbol and yellow cross on the map. Distance - 3.53 km / 2.19 miles.